Since FHA announced the recent reduction in the monthly mortgage insurance rate, the FHA Streamline Refinance has become a popular product for mortgage refinances because of the savings to homeowners. In order for an existing FHA loan holder to get the reduced premium and lower their monthly payment, they must refinance. The existing loan must have been paid for at least 6 months before refinancing. There are different types of FHA streamline refinance products and they may vary by lender in terms of their requirements. Below are some of the typical requirements of 3 types of Streamline products offered by lenders. Under the guidelines of this product, credit is pulled for ONLY the mortgage on the property being refinanced and no FICO scores are provided. Some lenders will permit there to be one mortgage late payment in the last 12 months as long as it is not within the last 90 days. On the loan application no income is required to be listed or verified. This option can be done with or without a property appraisal. 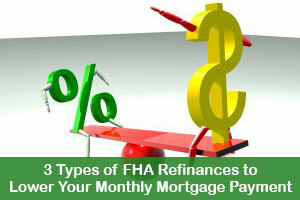 See below for important differences when refinancing without an appraisal on each of these products. The mortgage rate on this refinance will be significantly higher than rates found on each of the options below. Under this program, credit will be pulled for ALL properties held by the borrower and FICO scores will be reported. One mortgage late payment in the last year may be acceptable as long as it is not within the last 90 days. The minimum allowable score for this type of refinance is 580 (varies by lender). As with the No Score Streamline, no income is reported or verified on the application and it may be done with or without an appraisal. Interest rates will be lower than the No Score Option. A full credit report with FICO scores will be run and income will be fully documented. Debt-to-income ratios will also be calculated and the borrower must qualify under the maximum allowable debt-to-income criteria established by the lender. This ratio varies by lender and by credit score, but typically will be 45% – 55%. This refinance also can be done with or without an appraisal. The rate on this loan will be better than under the previous two options. As stated above, the borrower can decide whether or not they wish to obtain an appraisal on the property. The main difference between the two is that closing costs and prepaid expenses may only be added into the new loan balance when an appraisal is obtained, assuming the appraised value is high enough to allow for inclusion of those items in the loan balance. When choosing to go without an appraisal, the borrower must pay these costs out of their own funds. In some instances, depending upon the interest rate selected, the lender may offer a credit to offset some of the closing costs. When an appraisal is not obtained, the original appraised value will be used. This can be a benefit for homeowners whose home may have declined in value and may currently be lower than the outstanding loan balance (underwater). The lender will require that there is a valid benefit to the borrower. These guidelines depend on whether you are refinancing from an ARM (adjustable rate mortgage) to a fixed rate loan, or from a fixed rate loan to a new fixed rate loan. When going from one fixed rate loan to another, the benefit to the borrower must be a reduction in principal and interest plus mortgage insurance of at least 5%. When switching from an ARM to a fixed rate, the new rate cannot be more than 2% higher than the current ARM rate. No cash back is allowed. All FHA loans carry an upfront mortgage insurance premium and a monthly mortgage insurance premium. The rates for these premiums have consistently increased in recent years, until January of this year when they were lowered. The amount you will pay when refinancing to a new FHA loan will depend upon when you took out your existing loan. Borrowers whose existing loan was endorsed prior to May 31, 2009 are grandfathered in to a monthly premium based on .55% annual rate and will pay an upfront premium of only .01% of the loan amount. The upfront mortgage insurance premium for these borrowers will be 1.75%. Borrowers who are refinancing within three years of the existing loan will receive a refund of the original upfront premium paid. The amount of the refund declines over time as the three years elapses. Many borrowers whose original loan was taken out after May 31, 2009 may be paying mortgage insurance premium rates that are much higher than the rates shown above – many who obtained their loans recently are paying as high as 1.35%. This reduction along with a rate reduction, if possible, can offer significant savings to the borrower. How Long are Mortgage Insurance Premiums Required to be Paid? Once again, borrowers whose loan was endorsed prior to May 31, 2009 follow different guidelines than those who obtained their current loan after that date. If the existing loan was endorsed after May 31, 2009, mortgage insurance premiums on the new loan will be required to be paid for 11 years (if the loan-to-value is less than 90%), and for the life of the loan if the loan-to-value is over 90%. Loans endorsed prior to May 31, 2009 may have mortgage insurance canceled once the loan reaches 78% of the original value, as long as they have paid a minimum of 5 years. FHA borrowers may also wish to consider whether their existing mortgage now qualifies for refinancing under a conventional loan. Mortgage insurance premiums may also be less, or possibly eliminated, by converting to a conventional loan. However, in this case, there are no streamline options with less documentation and an appraisal must be obtained. Could You Save on Your Monthly Mortgage Payment? A mortgage loan originator can help you determine if you could lower your monthly mortgage payment by refinancing. You will be asked a few questions about your existing mortgage, and the mortgage originator can explain your refinance options based on the information given.